Simply mix the 5 ingredients in your blender, grab some cute glass bottles from Ikea or your local dollar store and fill them up. My family especially enjoyed the mini stocking stuffer bottles I did last year. Perfect for your Christmas morning coffee. I used to make tons of complicated Christmas cookies, but now that I have 3 kids I have limited time for making dough, rolling it out, cutting, icing etc, so I've moved on to some simpler recipes. Mainly ones that involves melting chocolate in the microwave like this Homemade Peppermint Pattie Recipe. So easy to make and always a big hit parties. You really can't go wrong with mint and chocolate at the holidays. Kids freaking love hot chocolate, so what's better than a jar of homemade hot chocolate mix with mini marshmallows? I know my kids would love this gift, so that's why I made a bunch for our friends and neighbours with little ones. I hope they enjoy it over the winter holiday. Once again this is a Smitten Kitchen recipe and only has a few simple ingredients. You toss them in the food processor, mix them up and divy it into jars. Couldn't be easier. This DIY Bum Balm is an absolute favourite in our house. Best of all, it's not just for bums! This stuff is amazing at this time of year when dry and cracked skin flares up. Friend's and family now ask me for jars of it for their winter skin. So I thought it was appropriate to share it again here as a great holiday gift. This luxurious and simple Honey Coconut Face Scrub Recipe has been a long time favourite of mine. This week I whipped up a giant batch in mere minutes to gift to some of the lovely ladies in my life. *Please Note: I recommend using a plastic lid on anything that will be kept in the bathroom. Metal ones tend to rust which isn't so nice on your face scrub. I will switch these up before gifting them. I'm a chocolate and caramel addict so it's no surprise that I wanted to replicate these babies at home. I've tried making them with my own caramel several times, but always come back to this Homemade Turtle Recipe with the little square caramels. Mmmm...sometimes the lazy microwave version is totally the answer ;) Personally I like chocolate all the way around my turtles so I don't just cover the top. I pick up the pecan caramel cluster (solid from a few minutes in the freezer) and put it on a fork. I toss it in the chocolate gently upside down and flip it over, then I strain off the excess chocolate on the fork before resting it on parchment paper to cool. This week I will be making up some more batches of these goodies and dropping them off with friends and family. 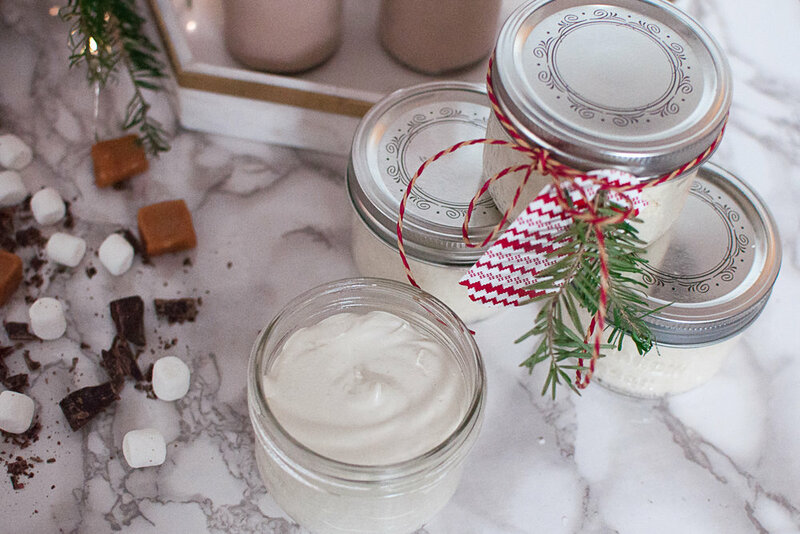 Let me know if you make any of these Holiday DIYS for your loved ones. I would love to hear how they go over.